not so green - Exclamation! Here's a cute shot from Flickr user monika herodotou of the Mediterranean coast of Turkey. The city of Kalkan is at right-center, its harbor partially protected by the offshore islands of Catal (the body of the exclamation point) and Sican (the point). 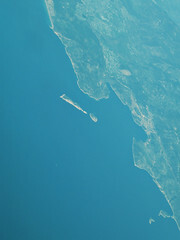 The small islands of Heybeli and Saribelen lie closer to the coast at the bottom of the image.